I actually can’t believe that today marks a year until I get to marry my best friend. It has now officially reached the year before the wedding territory. I know that seems like such a long time away but with the way this year flew by, it will be here before we know it. I haven’t really shared much wedding related content on the blog since my engagement in September. I was waiting until I asked my bridesmaids to be apart of my big day to start my wedding series, but now that I have done that, I am ready to start participating in Wedding Wednesday at least once a month if not more. Now onto what has happened up until the year before the wedding. Picked a date // I have always dreamed of having an outdoor ceremony and with the unpredictable Texas heat, late fall and winter are pretty much the only options…so we chose November since there’s more of a chance it’ll be cooler on our wedding day. Picked our venue // Before picking a venue, I browsed through websites like WeddingWire and theKnot and kind of had my heart set on a hill country venue in Austin. When I began contacting venues for tours, I realized that if I wanted to get married in the fall of 2016, most of those venues just weren’t going to work out solely because most of them were booked for Saturdays throughout the entirety of fall. Of course, I could have gone with a Friday wedding, but I didn’t want to compromise on the day just for a certain venue…so I scrapped those ideas completely and sought out something different. I ended up finding a really beautiful all-inclusive venue for quite a bit cheaper than one of the hill country venues would’ve been. I am pretty stoked to not have to worry about contacting each individual vendor and having a little less stress on my plate. Picked wedding colors // I kinda already had this planned before I even knew who I was marrying, not gonna lie, but I officially settled on wedding colors. I will be revealing those along with my bridesmaids asks soon. Asked our wedding party to join us on our big day // Michael did this way sooner than I did because asking dudes are to be in your wedding party is a lot more simple. Give them a cigar or some alcohol and they’ll be good to go. I made some pretty elaborate bridal boxes for my bridesmaids that I will featuring here on the blog soon. They were filled with fun, girly things and showcased the wedding colors that I picked. Scheduled engagement photos // We will be taking our engagement photos on December 6th. I have already picked out one of my outfits and am still trying to figure out the other. I am so excited for these and can’t wait to see how they turn out. Scheduled engagement party // Though I still have to nail down all of the details, we have a date for our engagement party weekend. Since pretty much all of our wedding party live in different cities, it is difficult for all of us to get together so I decided it’d be fun for everyone to all get to know each other over the course of a weekend. I am pretty thrilled about the short to-do list in preparation for the big day. I think I would be extremely overwhelmed if my venue wasn’t all-inclusive. I was a little iffy about it at first because I thought I wouldn’t be able to customize things as much as I wanted, but realized that I can still add my own flair to things. I am so excited for what’s to come in the next year and to enjoy just being engaged for awhile. Are you married or engaged yet…or perhaps just planning your wedding via Pinterest regardless? 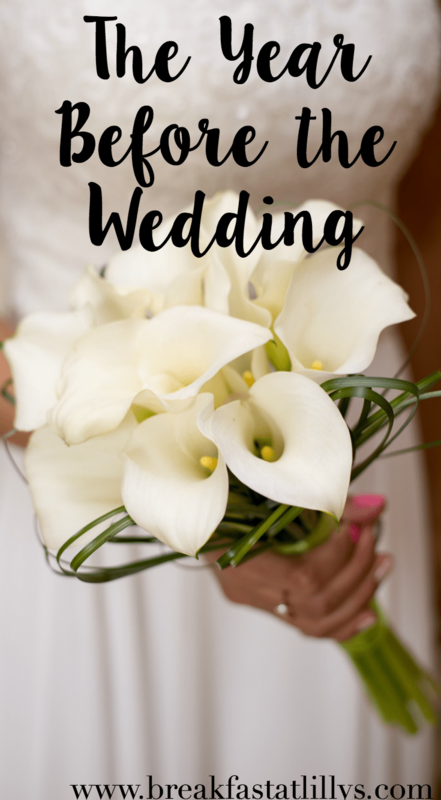 What did you do to prepare the year before the wedding? Let me know down in the comments.